While almost all Lazuli Buntings are wintering in western Mexico, last week one was visiting feeders in Ottawa, Ontario. 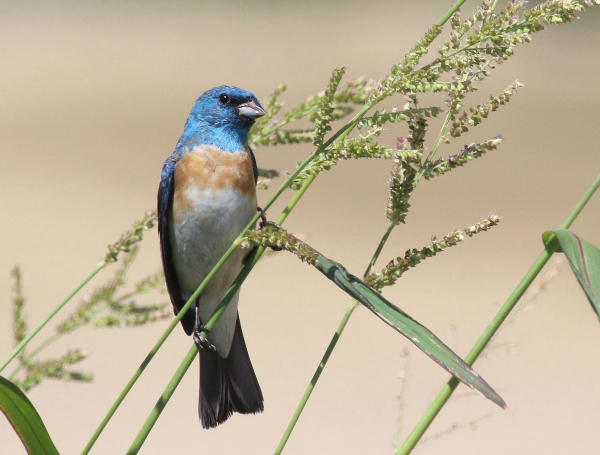 Sometimes we imagine rare bird sightings are limited to the far corners of the wildest locations, but most weeks we find that backyard landscaping and feeding stations are attracting some of the rarest birds in North America. Just consider the vagrant birds that are reported by birders in their yards each week in the Rare Birds article. In this issue alone, such remarkable rare birds as a Yellow Grosbeak, two Bramblings, a Lazuli Bunting and two Varied Thrushes were all found by birders who reported the rare species at feeders! Where? The two Bramblings, small finches from Eurasia, made it to feeders on opposite sides of Minnesota last week; two Varied Thrushes were observed at feeding stations in Suamico, Wisconsin and Staten Island, New York; a wayward Lazuli Bunting was visiting a feeder in Ottawa, Ontario; and, of course, a first state record for Texas – a Yellow Grosbeak (a Mexican species) – is visiting a feeder in the town of Cancon, in southern Texas. Not bad for a single week in the backyard realm. Other recent rare backyard birds have included a Crimson-collared Grosbeak at a feeding station in McAllen, Texas (this grosbeak is another Mexican species very rarely encountered north of the border); a Spotted Towhee was visiting a feeder on the north end of the Upper Peninsula of Michigan, and a Cape May Warbler was feeding at a suet feeder in northwest Washington. Imagine the excitement of the lucky birders who hosted these special birds. To further underline the rare bird contributions of backyard birding, 20 percent of the rarest of the rare birds that have been featured in 2018’s Top 10 Vagrants by the American Birding Association were found in people’s yards (see the associated Birding News article in this issue). Two of the Top 10 were backyard birds; namely, the Number 4 ranked Stygian Owl found hiding in a Key West, Florida yard, and the Number 10 ranked Fan-tailed Warbler that was observed hunting small insects on a birder’s lawn in southeast Arizona. The owl probably originated from the Caribbean, possibly Cuba, and the warbler most likely wandered north from its normal range in western Mexico. With Project FeederWatch coming up next week, from February 15 to 18, it will be exciting to see what kinds of rare, wayward birds that people will find in their yards! Keep your eyes peeled because, obviously, you never know what might show up in your yard or neighborhood.